This is our first in a series of 360 videos. This video shows a core coming on deck on the catwalk. It fades to a microbiologist taking a sample from the core, and then the technicians beginning to take the 1.5 meter sections of the cores into the lab. On the wall opposite the core liner, you can see a micropaleontologist waiting for the core catcher sample to take back to the lab. In the doorway, co-chief scientist Laura De Santis observes along with other scientists. 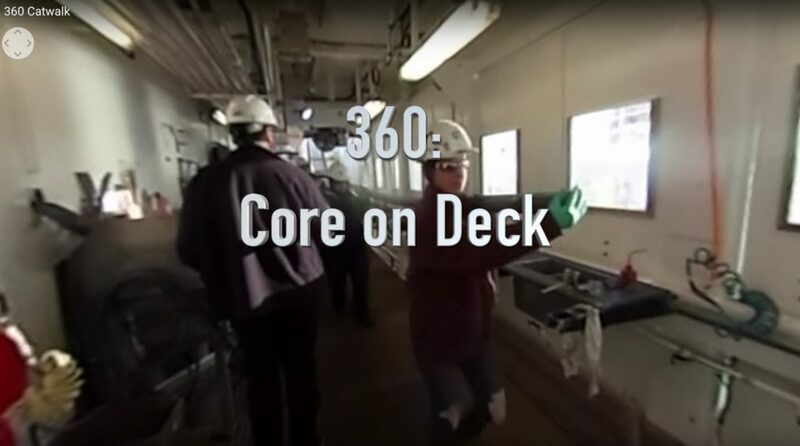 Future 360 videos will show you other parts of the ship and be incorporated into the current JOIDES Resolution ship tour. To interact with a 360 video, click and hold your mouse and scroll around the screen. You can see all the way around, a 360 degree view. If this view isn’t working for you, try using another browser like Google Chrome.